The Fulbright Scholar program was founded in 1946 by U.S Senator J. William Fulbright, who believed that reaching out to other countries provided learning opportunities that could build bridges of cultural understanding and awareness. This came as a reaction to a divided world after the end of World War II. Fulbright hoped to promote peace through mutual understanding of cultural differences. 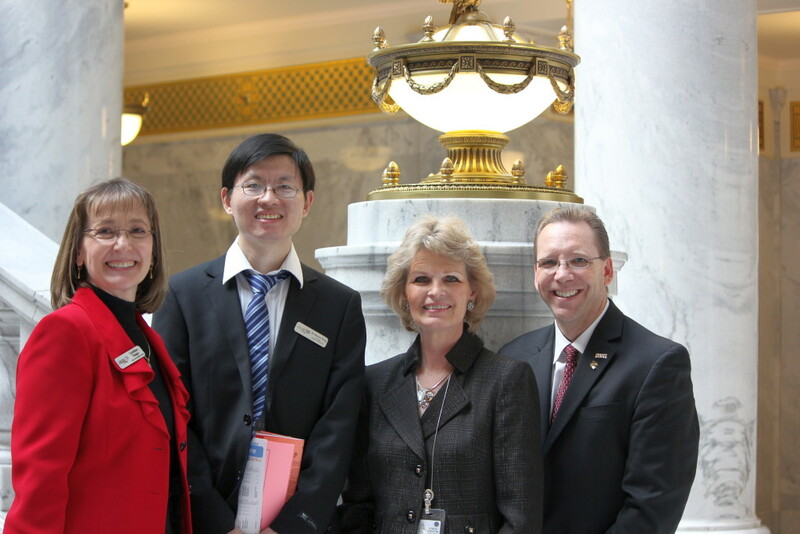 Dr. Baohua Wang, Salt Lake Community College’s first Fulbright Scholar-in-Residence, visits from China on a semester-long grant program to advance his research and promote cross-cultural awareness. Dr. Wang (pronounced wong) is a teacher of Traditional Chinese Medicine at the Chinese Capital Medical University in Beijing. He specializes in the theory and application of acupuncture, among other Chinese medicine practices. Dr. Wang will give lectures on his research in the field of medicine and will work with SLCC’s School of Health Sciences to share his knowledge on the differences between Eastern and Western medicine. 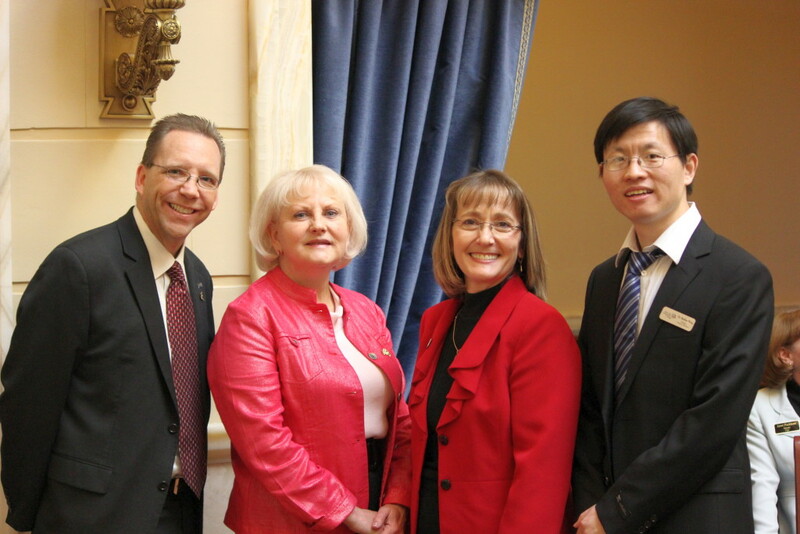 Not only is this SLCC’s first Fulbright scholar, it is also the first time Dr. Wang has been outside of China. His specialty has to do primarily with the Classical Theory of Acupuncture. Dr. Wang has a deep passion for helping people. He was first introduced to Chinese Medicine by his grandfather who practiced medicine, and began practicing himself in 1996. The main difference he sees between Eastern and Western Medicine is that Western medicine views the body in parts whereas Chinese medicine views the body as a whole that cannot be divided. Using a toothache as an example, he explained how Western doctors look at the tooth itself as the problem but, he explained, a Chinese doctor would look at the stomach and kidney to find a deficiency in the kidney as the cause of the toothache. The toothache, according to Dr. Wang, is only a symptom of the problem. Students and faculty can expect to hear this kind of alternative approach to medicine in Wang’s lectures. AcupunctureThe general theory of acupuncture is that the body is controlled by an energy called Qi (pronounced chee) and blockages of Qi are responsible for illnesses in the body. Acupuncture is the precise application of needles to a person’s body in order to stimulate the body’s natural response to heal, aiding the flow of Qi and allowing the body’s defenses to combat pain and illness. “Last fall 2010, the Academic Affairs Division was having conversations regarding enhancing international education and internationalizing the campus,” wrote Dean Loredana Haeger, Ph.D. of SLCC’s School of Health Sciences on how they decided to bring a Fulbright scholar here. There is a new trend in the health industry to broaden the horizons of medical practitioners to include alternative therapies. The School of Health Sciences at SLCC is hoping to develop a course in Eastern vs. Western medicine practices. Professor Ken Freeman, a faculty member in the Physical Therapist Assistant program, has been working with Dr. Wang to develop a course that takes advantage of his knowledge of Chinese Traditional Medicine. Dr. Wang wrote a book primarily for the Chinese people called “To Learn Chinese Medicine from Zero,” which is a beginner’s guide to learning and understanding the basics of the practice. He hopes to one day have it translated to English to benefit the field of Western medicine. He has found that many of the Chinese people have forgone Eastern practices in favor of Western traditions of surgery for pain management. The reason he sees this happening is for the business of making money. Dr. Wang will be giving a lecture to faculty, staff and students on March 27 at the South City Campus. Additional speaking engagements and lectures by Wang are being scheduled and should be posted on the SLCC website and The Globe calendar of events.